Under the preceptors’ eyes….I found this scene intriguing on several levels. The Shankaracharyas look on at life today. 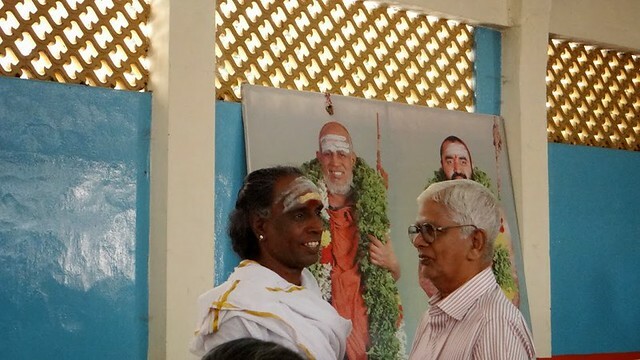 The younger of the two men has the outward appearance of the traditional Tamil Brahmin…the “kudumi”, the sacred ash and sandalwood smeared on the forehead, the “anga vastram” on the chest…the older has his hair cut the modern way, and is wearing a shirt. But the age-old oral tradition goes on…the “karna parampara” of “you speak, I listen, and information is communicated”. It’s less charitably referred to as gossip! Chennai, 260214.